This is an editor's draft of a document for the Semantic Web in Health Care and Life Sciences Interest Group (HCLSIG). This is a live document and is subject to change without notice. It reflects the best effort of the editors to reflect implementation experience and incorporate input from various members of the IG, but is not yet endorsed by the IG as a whole. This document is not endorsed by the W3C or its member companies. The life sciences have a rich history of making data available on the Web, because researchers recognized the benefits of sharing data and made it available to other researchers for the benefit of greater science. However, because many of the data repositories were developed in relative isolation, they tend to use different identifier schemes, incompatible terminology, and dissimilar data formats. This makes it hard for researchers to find all data about an entity of interest and to assemble it into a useful block of knowledge. This prototype was built to demonstrate how Semantic Web technologies can integrate such heterogeneous data sets and thereby help scientists to more easily answer interesting scientific questions. The key to advancing scientific understanding is empowering scientists with the information that they need to make well-informed decisions. Scientists need to be able to easily gain access to all information about chemical compounds, biological systems, diseases, and the interactions between these entities, and this requires data to be effectively integrated in order to provide a biological systems level view to the user, i.e. a complete view of biological activity. However, achieving this goal has proven to be a formidable challenge in the life sciences, where data and models are found in a large variety of formats and scales that span from the molecular to the anatomical. In order to overcome the challenge of gaining insight directly from the Web, a number of laboratories, organizations, and companies have built internal data warehouses from the publicly available data sources. This certainly helps scientists to more easily query for all information related to entities of interest. However, these efforts generally integrate only a subset of publicly available data that is deemed to be of greatest interest, and it has proven difficult to add data sources to the warehouse at a later point. Further, advances in scientific knowledge require regular changes to be made to the underlying data models, and this is not straightforward with a relational model. Organizations that use this approach also typically face challenges with representing data that is at different levels of abstraction, and that includes data of very different quality. Many health care and life sciences organizations are interested in the data integration abilities promised by the Semantic Web. More specifically, the benefits include the aggregation of heterogeneous data using explicit semantics, and the expression of rich and well-defined models for data aggregation and search. Semantic Web technologies enable one to more flexibly add additional data sets into the data model, and more easily reuse data in unanticipated ways. Once data has been aggregated, a Semantic Web reasoner computes implied relationships among the aggregated data resulting in tighter integration and the possibility of additional insights. This prototype knowledge base imports data from data sources that span multiple domains in the life sciences to make cross-discipline queries. It therefore provides a working (and reproducible) example of the possibilities that become available via knowledge integration. The use of an RDF repository to store RDF and OWL makes it possible to query, manipulate, and reason about the data with standard tools, such as OWL reasoners, and languages, such as the SPARQL Query Language for RDF. Although this document addresses a specific use case, the approach described here can be applied to any use case that integrates data from multiple domains. This document attempts to succinctly describe how this knowledge base was constructed so that interested parties can use the core techniques to create their own knowledge base. We have attempted to write a general description but, unavoidably, the knowledge base makes use of specialized resources, such as those found in the Data Sources section. Some, but not all, of the reasoning behind design decisions is explained. Several technologies such as the Semantic Web standards RDF, OWL, and SPARQL were used, but in order to keep this document to a manageable size, we will not explain all aspects in the depth that would be required for those new to the area. Those interested in a general introduction to the Semantic Web should see The Semantic Web Primer. See also the CO-ODE web site for a hands-on OWL tutorial with Protégé. 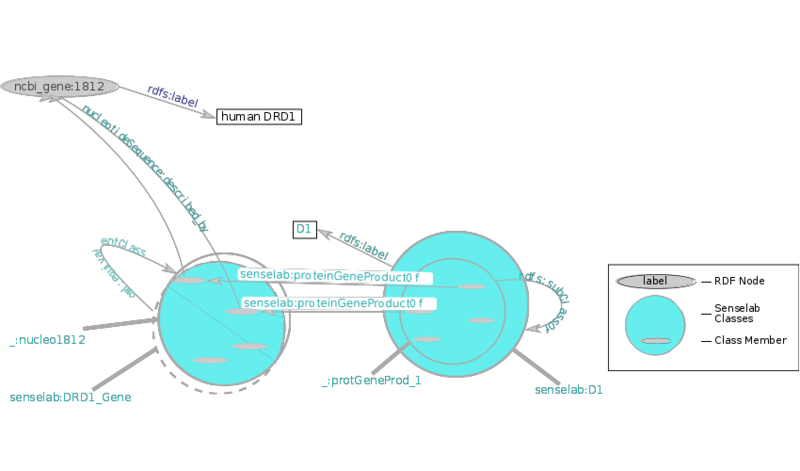 For materials introducing ontology see National Center for Biomedical Ontology(NCBO) Introduction to Biomedical Ontologies. For materials related to reasoning see The Semantic Web: Ontologies and OWL. This document uses URLs to identify records about biological entities and processes. The identifiers used in this document are the same as those used in the prototype knowledge base and are not yet stable. Knowledge base implementors should use these terms whenever possible. 1 Introduction motivates and explains this document. 2 Use Case introduces an interesting scientific question that the knowledge base can be used to address. 3 Data Sources describes the data sources that have been incorporated into the knowledge base. 4 Design Decisions explains the reasons for several design choices. 5 Importing to RDF - Homologene Example explains the process of translating data into RDF triples. 6 Query explains the use case query that answers the scientific question. 7 Data Model explains the basics of RDF triples. 8 Adding a New Data Source explains how the SenseLab database was integrated. 9 Named Graphs discusses the use of named graphs and query details. 10 Opportunities for further development discusses problem areas and possible improvements. Alzheimer's is a debilitating neurodegenerative disease that affects approximately 27 million people worldwide. The cause of Alzheimer's is currently unknown and no therapy is able to halt its progression. However, insight into the mechanism and potential treatment of this debilitating disease may come from the integration of neurological, biomedical and biological resources. The knowledge base assembles several neurology-related resources alongside an array of clinical and biological resources. This makes it possible to integrate knowledge across several research domains and potentially provide insight into the mechanisms of the disease. The scientific question under scrutiny in our use case involves several elements of putative functional importance to Alzheimer's. CA1 Pyramidal Neurons (CA1PN) are known to be particularly damaged in Alzheimer's disease and play a key role in signal transduction. Signal transduction pathways are considered to be rich in proteins that might respond to chemical therapy. By integrating information about signal transduction, pyramidal neurons, their genes, and gene products, the query corresponding to our scientific question can provide information relevant to researchers that are looking for drug target candidates that are potentially effective against Alzheimer's Disease. In order to incorporate data from several information sources, it was necessary to convert several exported formats, each into its own RDF bundle. The largest RDF bundle of 200M triples resulted from MeSH associations with PubMed articles. In contrast, there were a number of smaller bundles ranging from 10K to 10M triples. This resulted in a total of approximately 350M triples occupying approximately 20GB when loaded into the RDF repository. In several cases, we extracted only a subset, for example, by selecting only human, rat, and mouse data. Click on [Details] in the table below to view details such as the date of the last extraction. A number of design decisions were made during the construction of the prototype knowledge base. Many of the decisions were pragmatic in nature, as a consequence of the need to implement the solution on a commodity PC within a two-month period for a demonstration at WWW2007. HTTP URIs were adopted as the mechanism to identify biological entities. In particular, URIs with a Persistent URL (PURL) were used as they provide re-direction capabilities, which make the identifiers more robust against future change. While data in different information sources may talk about the same thing, one must provide a common set of identifiers in order to get the RDF graph to connect. For instance, the named graph PubMesh uses gene record identifiers to relate genes to PubMed articles. It uses terms like ncbi_gene:1812 to identify a gene record. The Gene Ontology database records use the same identifiers, which allows us to easily link information contained in the two corresponding named graphs. New databases are able to connect their data graphs to the existing store by re-using the same terms. We accomplished this by translating internal identifiers from the databases into URIs in our chosen scheme. An ontology was built with sufficient detail for the immediate needs of the demonstration and was limited by the date of the demo. Consequently, it contains more detail in the core areas of focus, than in areas of more peripheral interest. The ontology was written in OWL-DL so that we could specify statements in an interoperable and computable way. We also wanted to verify small subsets for consistency during development, with the hope that in the future a more capable repository will be able to do appropriate inferences based on the class and property definitions. The ontology distinguishes between real world entities and documents about real world entities. We endeavored to follow the OBO foundry methodology, which espouses the principle that we first identify what instances are by identifying them with physical things, such as a molecule in some person's body. Classes are defined as sets of those instances. For example, the class of glutamate receptors can be defined as multimeric macromolecules that have high binding affinity for glutamate molecules. Expressed more formally, we can say EVERY glutamate receptor IS_A multimeric macromolecule THAT has high binding affinity for SOME glutamate molecule. In this way, the class of glutamate receptors can be defined in terms of the classes multimeric macromolecules and glutamate molecule, something which OWL expresses quite naturally. The knowledge base contains many such definitions of classes. Once the data was converted into RDF/OWL, it was loaded into the triple store as a number of separate graphs. This approach made it simpler to re-load and update data, which was required often as a consequence of iterative enhancements to the ontology. This fast upload capability proved critical as the data reached the scale of hundreds of millions of triples. This partitioning of data also helped queries to be performed rapidly. Our approach has been to choose a representation in valid OWL-DL, with the expectation that queries would be evaluated against all answers that could be inferred from our representation. However, our triple store has no native inferencing capabilities. To enable querying against inferred information, we added pre-computed inferences in the form of non-OWL-DL, direct class-class relations, to the classrelations graph (see Named Graphs section). These non-OWL-DL relations were added so that it would be easy to use SPARQL queries to access the inferences, which were in some cases represented in OWL as property restrictions, as in the case of partonomic relations. The direct class-class relations were more compact to represent in RDF and queries that took advantage of them were easier to write in SPARQL. A number of different approaches were used for the conversion of data into RDF/OWL. The most commonly used approach was the use of Lisp code to read text exports of the data and create OWL or RDF documents. We will focus on the example of importing data from Homologene. Read the data into your program: This can be accomplished by first exporting to a text format of choice (CSV, tab-delimited, XML, etc.) and reading that format in or accessing the database directly with a database connector. Write the data into the desired RDF format: This can be in the form of an RDF/XML file that is then loaded into the repository. The Turtle format of RDF is also often supported and may be easier to produce and manipulate. Another approach is to use software libraries that allow you to add triples directly to your repository. In the case of Homologene, we start with a text file that contains the exported information. The original tab delimited file is ftp://ftp.ncbi.nih.gov/build54/homologene.data. We are interested in the first 3 fields. The first field identifies the homologous cluster. The second field is the species taxon. The third field is the EntrezGene id. We are only interested in human, mouse, rat, taxon ids: "9606" "10116" "10090". homologene:cluster_r54_99949 sciencecommons:has_homologous_gene_record rdf:resource ncbi_gene:678753 .
homologene:cluster_r54_99949 sciencecommons:has_homologous_gene_record rdf:resource ncbi_gene:727759 . Note that we used HTTP URLs to identify Homologene records by prefixing the EntrezGene identifiers (e.g. 727759) with a stem URL, http://purl.org/commons/record/ncbi_gene/. The resulting URL can be usefully resolved with a web browser. The domain purl.org serves Persistent URLs (PURLs), which currently redirect these requests for NCBI gene identifiers to a script at sw.neurocommons.org. If the community wishes to move the service to, for instance, an NCBI page about these genes, they can simply notify the custodians of purl.org. This extra level of indirection protects these identifiers from becoming orphaned as organizations stop existing or change their priorities. These URLs were also used to identify gene information imported from other data sources, automatically linking the Semantic Web representations of these records. For example, PubMesh statements about gene records use these same identifiers for genes, as do the statements from Gene Ontology and SenseLab. This allows for trivial data integration between different resources involving Entrez Gene records. Our scientific question can be summarized as "What genes are involved in signal transduction that are related to pyramidal neurons?". The scientific question can be answered with the following query, which searches for gene names and processes from four data sources within the knowledge base. The data sources include: MeSH (Pyramidal Neurons), PubMed (Journal Articles), Entrez Gene (Genes), Gene Ontology (Signal Transduction). The example query selects the gene name of the genes involved in signal transduction that are related to pyramidal neurons. Some of the complexity in this query comes from the need to capture relevant anatomical and functional detail at the subcellular and molecular level. The portion probing the Gene Ontology queries a set of classes describing processes at the molecular level. Our query employs the SPARQL RDF query language to perform knowledge integration across the sources of the knowledge base. Details on SPARQL can be found in the References. [Note: The query below will not work verbatim at SPARQL endpoints. We have simplified the actual Banff demonstration query for explanatory purposes in our example below. The Banff demonstration query is discussed in more detail in Named Graphs Section. You can try running the query HERE.]. Please note that the same color is used to connect the descriptive text in the query with relevant portions of the figure. # PubMeSH includes ?gene_records mentioned in ?articles which are identified by pmid in ?pubmed_records . # The Gene Ontology has a set of ?proteins such that foreach ?protein, ?protein ro:has_function [ ro:realized_as ?process ]. # Also, foreach ?protein, ?protein has a parent class which is linked by some predicate to ?gene_record. # Each ?process (that we are interested in) is a subclass of the signal transduction process. The following section describes the RDF data model and how we employed it to make our query possible. The data in the knowledge base is modeled in OWL-DL, which has been expressed as RDF triples. Briefly, an RDF triple consists of a subject, predicate, and object. The predicate is also known as the property of the triple. Subjects and objects in the data unify to create an RDF Graph, with subjects and objects as nodes and predicates as edges. For more information about RDF and OWL, see the References section in the Appendix. Nodes labeled with a leading "_:", e.g. _:activateAdenalCyclase, are called RDF blank nodes [CONCEPTS]. These frequently have machine-generated identifiers and are therefore typically opaque to a human reader (e.g., the set of all nodes that represent protein entities linked to the GO molecular function Adenal Cyclase Activation). Here, for the purposes of explanation, they have been named to convey meaning to the reader. Blank nodes ending in "_1" in this document indicate this blank node is one of many in this class, e.g. _:signalingParticipants_1. A set of genes or gene products in human bodies are described by ncbi_gene:1812. Here, we call this set _:equiv1812. protein:ncbi_gene.1812 has the same extension (members) as the OWL restriction _:equiv1812. X is a member of the class NamedClass (and vice versa). See OWL Web Ontology Language Semantics and Abstract Syntax Section 4. Mapping to RDF Graphs for a formal treatment of this. There are many possible classes of substance participating in molecular signaling, one of which (called here _:molecularSignalers_1) is defined by the ability to activate adenyl cyclase. 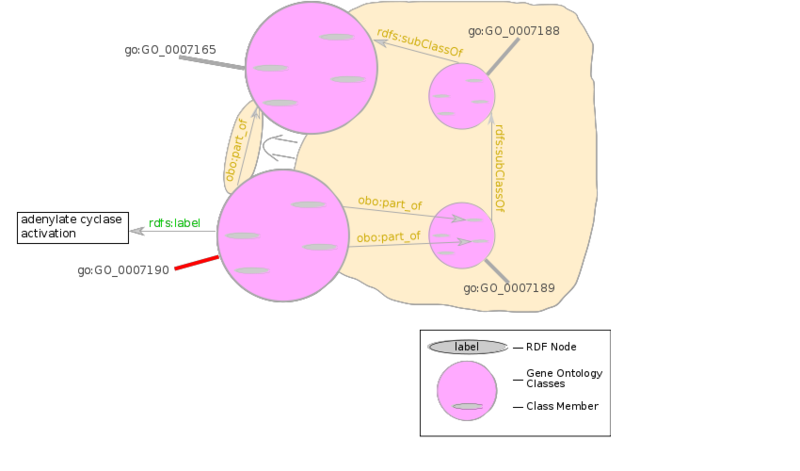 ncbi_gene:1812 and go:GO_0007190 have human-readable labels. ncbi_gene:1812 rdfs:label "Entrez Gene record for human DRD1, 1812" . go:GO_0007190 rdfs:label "adenylate cyclase activation" . and would need to query over a transitive closure of the union of the obo:part-of and rdfs:subClassOf rules. SenseLab is a collection of relational (Oracle) databases for neuroscientific research that was independently added to the knowledge base after the other data sources. An accompanying document, Experiences with the conversion of SenseLab databases to RDF/OWL, describes the details of adding it to this knowledge base. With this new data incorporated, the example query could be extended to extract data from the new data source, in this case, discovering the names of receptor proteins associated with the genes discovered in the previous query. In an integrative query of this sort, we can use the results as a starting point for more detailed queries of a particular repository, such as in this case SenseLab. # The Gene Ontology asserts that foreach ?protein, ?protein ro:has_function [ ro:realized_as ?process ]. # Foreach ?gene, ?gene senselab:has_nucleotide_sequence_described_by ?gene_record . # Foreach ?receptor_protein, ?receptor_protein senselab:proteinGeneProductOf ?gene . # Find the labels of all such ?receptor_proteins. The additional triples this matched in the SenseLab knowledge base connect to the existing data by talking about the same genes, e.g. ncbi_gene:1812. A nucleotide sequence is also described by ncbi_gene:1812. Here, we call this _:nucleo1812. The class senselab:DRD1_Gene has the same members as the OWL restriction _:nucleo1812. This _:protGeneProd_1 is defined by being a product of DRD1_Gene. Our solution is a subclass of _:protGeneProd_1 called senselab:D1. # Each ?process (that we are interested in) is a subclass or component of the signal transduction process. The named graphs help with both provenance and scaling. 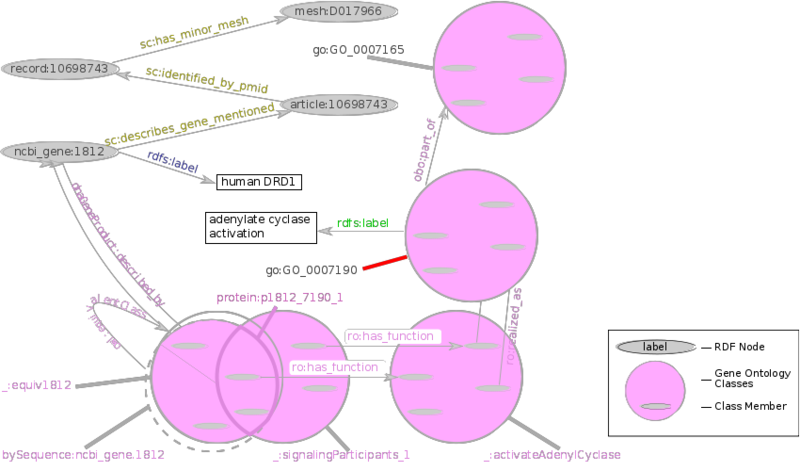 In the current approach, each RDF bundle is imported into its own named graph. This is useful for a number of reasons. First, we know the source of each named graph, so we can control and review which data sources are being accessed by our queries. Additionally, the association of a named graph with a data source serves as data provenance and can also be employed by schemes that exploit knowledge about the data source to assign confidence measures in a model of trust. For example, one of the knowledge base data sources resulted from text mining experiments to find protein associations. Users of the knowledge base can choose to view this evidence of association differently than the associations provided from a protein-protein interaction database. Also, named graphs support scaling by making it possible to update selected parts of the knowledge base, for example when the data source has new information or related ontologies are changed. Broaden the knowledge base to cover more of the related domains such as structural chemistry, cells, anatomy, physiology, behavior, protocols, and reagents. The sources accessed by a query could eventually be spread across repositories in separate locations to demonstrate the ease of integrating distributed data sources with Semantic Web. Create dynamic visual interfaces that provide the user with the means to create and refine a query without requiring prerequisite knowledge of the data or query language. What relations should we use to connect a biological entity with artificial entities describing it, e.g. protein records, sequence records, PubMed records? What is the best way to model evidence so that it can be recorded in data provenance? How are information resources such as database entry or XML document associated with a database entry best represented in BFO-friendly ontologies? Mapping across terminologies: MeSH, in particular has terms that are synonymous which many terms in other ontologies, including genes, proteins, GO terms, etc. We made efforts to harmonize the representation in certain cases, such as between Senselab and GO. In other cases, such as MeSH, we have done no harmonization so this should be reviewed for eventual corrections. Latest version available at http://www.w3.org/TR/owl-features/ . Latest version available at http://www.w3.org/TR/REC-rdf-syntax/. Latest version available at http://www.w3.org/TR/rdf-concepts/ . SPARQL Query Language for RDF , A. Seaborne, E. Prud'hommeaux, Editors, W3C Recommendation, 15 January 2008, http://www.w3.org/TR/2008/REC-rdf-sparql-query-20080115/ . Latest version available at http://www.w3.org/TR/rdf-sparql-query/ . Briefings in Bioinformatics 2007;8:163-171 doi:10.1093/bib/bbm012. Prototype of a Google-Maps interface to the Allen Brain Atlas. Entrez Neuron was developed by the SenseLab team as a graphical user interface for querying the SenseLab ontologies. We used the open source edition of the Openlink Virtuoso repository from http://sourceforge.net/projects/virtuoso/. Repository installation and steps for creating a mirror repository have been documented by Donald Doherty. All conversion scripts from Science Commons are available under a BSD license. MeSH conversion to SKOS was performed with an approach outlined in a 2006 European Semantic Web Conference paper from Mark van Assem et al. OWLIM is a high-performance semantic repository developed in Java. It is packaged as a Storage and Inference Layer (SAIL) for the Sesame RDF database. In memory of our friend and colleague William Bug, Ontological Engineer. Special thanks to: Alan Ruttenberg (Science Commons) who coordinated the assembly, conversion, and deployment of the data sets and ontologies and Susie Stephens (Eli Lilly) who coordinated the BioRDF task force. Together they presented the initial version of the knowledge base at a WWW2007 Banff workshop. Many contributed to the development, documentation and validation of the knowledge base, as well as the thinking behind it. Mikail Bota (USC) who kindly provided the BAMS database for our use and John Barkley (NIST) converted it to RDF. Huajun Chen (Zhejiang University), Matthias Samwald (Yale Center for Medical Informatics; DERI Galway; Semantic Web Company), Alan Ruttenberg, and Kei-Hoi Cheung (Yale Center for Medical Informatics) participated in the the SenseLab RDF Conversion. Members of the SWAN team: Tim Clark, Paolo Ciccarese, June Kinoshita, Gwen Wong, and Elizabeth Wu contributed the SWAN data source. June Kinoshita, Gwen Wong, Elizabeth Wu, Don Doherty (Brainstage Research Inc.), William Bug (School of Medicine, UCSD), and Alan Ruttenberg worked on the neurogenerative disease use cases. Ray Hookaway (HP) provided digests from Entrez Gene that were more easily converted to RDF. Jonathan Rees (Science Commons) did the RDF conversions of Addgene, Pubmed to Gene, Medline, and MeSH, the Neurocommons text mining pilot, and compiled the data source and licensing information for this document. Alan Ruttenberg did the RDF conversion of Entrez Gene records, GO Annotations, Allen Brain Atlas, Homologene, wrote the Science Commons ontology. Alan Ruttenberg and Matthias Samwald wrote the SPARQL queries described in this document. Chris Mungall (NCBO) wrote the converter that produced the OWL versions of the OBO ontologies and consulted on matters of ontology. Eric Neumann (Clinical Semantics Group) produced the Exhibit visualization. Alan Ruttenberg developed the Google Mouse prototype, with contributions from Mike Travers (CollabRX), Brian Gilman (SciLink), and Tom Stambaugh (Zeetix). Don Doherty, Matthias Samwald, Holger Stenzorn (DERI), M. Scott Marshall, and Eric Prud'hommeaux have presented this work at conferences. Barry Smith (State University of New York at Buffalo, USA) provided advice on ontology work and led the development of the Basic Formal Ontology, which inspired all ontology work related to the knowledge base. William Bug (School of Medicine, UCSD), Michel Dumontier (Carleton University), and Holger Stenzorn (DERI) reviewed and gave detailed comments on an initial draft of this note. Alan Ruttenberg Jonathan Rees and Susie Stephens, reviewed and contributed to several versions of the document. Susie Stephens coordinated the BioRDF task force, worked on presentations of the work, and wrote the introduction to this document. M. Scott Marshall (University of Amsterdam) and Eric Prud’hommeaux (W3C) edited and coordinated the production of this note. Eric Prud’hommeaux created the figures. We would like to offer special thanks for organizations which gave contributions of equipment and service. Through Ray Hookway and Jeannine Crockford, Hewlett Packard donated two machines for a period of six weeks during the demo. Science Commons hosted the the prototype during development and continues to host and develop a knowledge base derived from the prototype as part of the Neurocommons. MIT CSAIL hosts Science Commons and provided computer and networking infrastructure. Kingsley Idehen, Orri Erling, Ivan Mikhailov, Mitko Iliev, Patrick van Kleef and Anton Avramov from Openlink Software provided rapid technical support including several custom builds of the Virtuoso triple store to address early performance issues, making it possible to develop the prototype on an aggressive schedule. Evren Sirin from Clark and Parsia provided support for the Pellet OWL reasoner. misc edits from comments and contributors - in progress..
Misc. edits from William Bug, Michel Dumontier. Corrections from Susie, Jonathan, others. added explanation to Use Case, updated TOC and Outline to reflect new section "Adding a New Database"
More on incorporated databases and misc changes.